Gauge: 2 rnds dc with smaller hook size=1"
Note: Weave in loose ends as work progresses. Rnd 1: With size H hook and blue yarn, ch 4, join w sl st in 1st ch to form ring, ch 3, 11 dc in ring, join w sl st in top of beg ch 3 (12 dc). Rnd 2: Ch 3, dc in same dc, 2 dc in next dc and in each dc around, join as before (24 dc). Rnd 3: Ch 3, dc in same dc, 2 dc in next dc and in each dc around, join as before (48 dc). Rnd 4: Ch 3, dc in next 3 dc, 2 dc in next dc, * dc in next 4 dc, 2 dc in next dc, rep from * around, dc in last 3 dc, join as before, fasten off (57 dc). Rnd 1: Holding 2 strands white together and with size K hook, ch 2, 6 sc in 2nd ch from hook, join w sl st in 1st sc (6 sc). Rnd 2: Ch 1, sc in same sc, 2 sc in next sc and in each sc around, join as before, fasten off (12 sc). 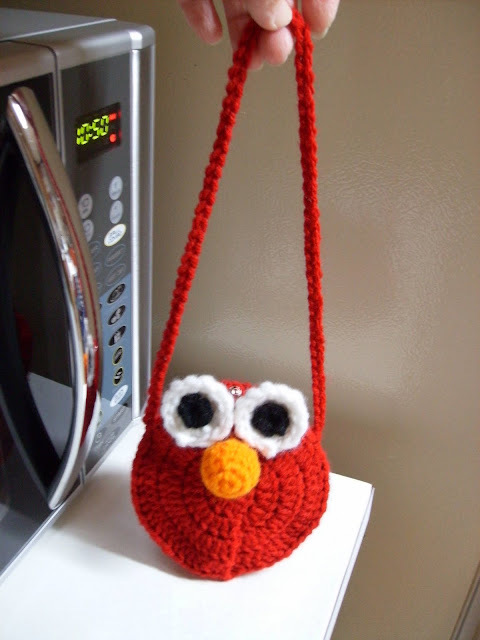 Pupil: With black and size H hook (using only 1 strand of yarn), ch 2, 6 sc in 2nd ch from hook, fasten off (6 sc). Finishing: With matching yarn, sew pupils to eyes as shown, one towards top of eye and the other towards bottom of eye. 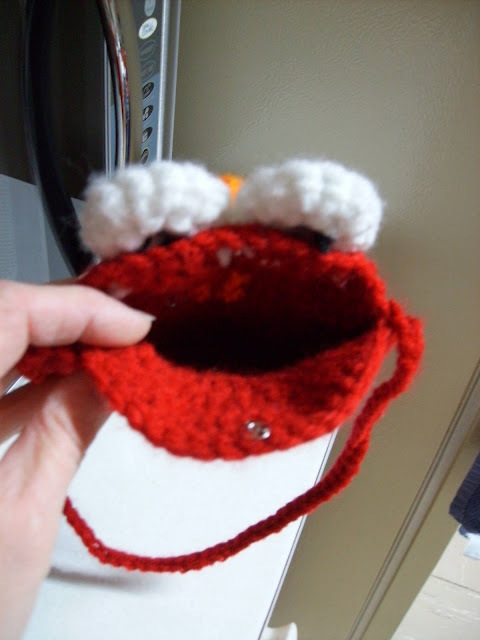 Sew eyes to top of one side of purse as shown. Hold wrong sides of purse together and with a long length of blue yarn, sew together through both loops of both pieces, leaving about 18 dcs free at top for opening. 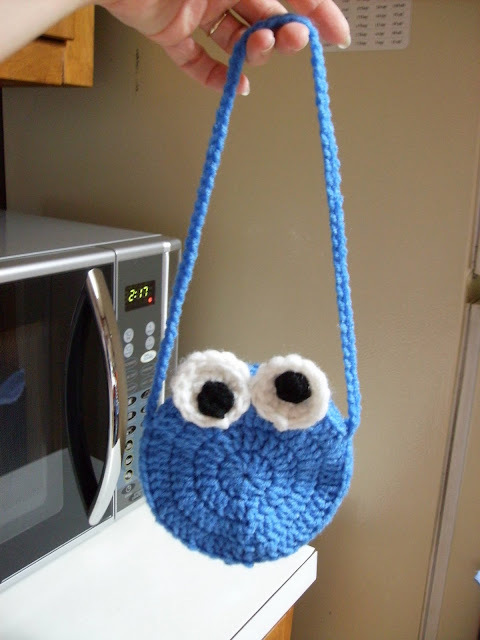 Strap: With one strand blue and Size H hook, ch 72 (or adjust ch to fit child), fasten off. Sew to sides of purse as shown. Sew snap to top inside of purse. 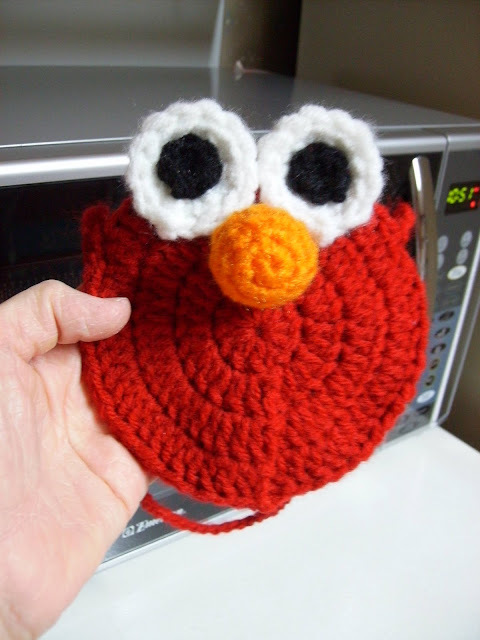 Do not sew in snap if you are making this purse for a child under 3. Rnd 1: With Size H hook and one strand orange yarn, ch 2, 6 sc in 2nd ch from hook, do not join rounds, mark end of each rnd with st marker (6 sc). Rnds 3-5: Sc in each sc around (12 sc). Rnd 6: Sc dec over 1st 2 sc and over each of next 2 sc around, fasten off (6 sc). Stuff with additional fiberfill if needed. Flatten nose into round ball. 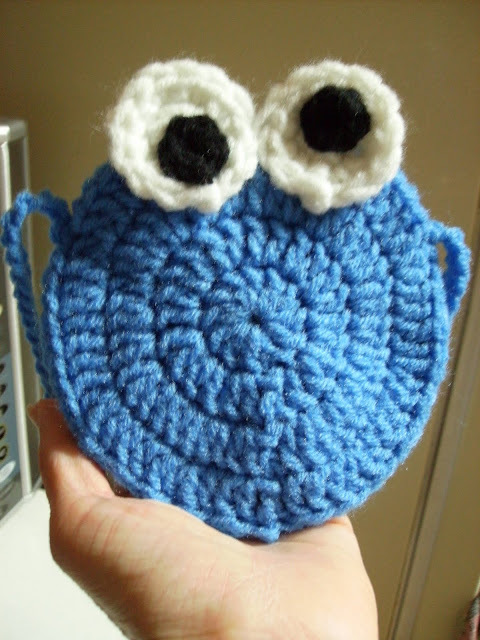 Finish the same as for Cookie Monster purse, sewing nose below eyes as shown.